Jefferson County Parks and Recreation Department threw a party on January 24th at Irondale Beach Park to celebrate the park’s recently completed remediation and restoration. GeoEngineers played a significant role in restoring the park, which encompasses the site of the historic Irondale Iron and Steel Plant. Staff from GeoEngineers joined in the festivities, which featured remarks by state and local officials, a ribbon-cutting ceremony, appreciation certificates and site tours. Located near Port Townsend on Washington’s Olympic Peninsula, the Irondale Iron and Steel Plant was operational between 1881 and 1919. At the time of operation, the plant was one of only three iron plants on the west coast and was later the only plant west of Colorado to produce steel from its own raw materials. At its peak in 1910, the steel plant produced more than 700 tons of steel per day and employed 600 workers. The park property is part of the Irondale National Historic District, which is listed on the National Register of Historic Places. When the plant was closed, incomplete cleanup efforts left slag and other industrial debris behind, along with a 6,000-barrel above-ground petroleum storage tank and remnants of several large brick charcoal kilns. 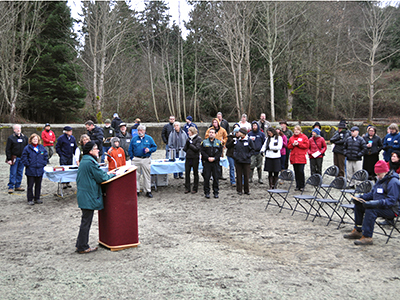 The Washington State Department of Ecology (Ecology) identified the site as a high-priority cleanup area as part of Washington State’s Puget Sound Initiative to restore Puget Sound and Hood Canal ecosystem health. In 2007, Ecology engaged GeoEngineers to complete a Remedial Investigation, Feasibility Study and Cleanup Action Plan to address the contamination at the plant site. As part of this work, our staff completed a Terrestrial Ecological Evaluation to calculate appropriate cleanup levels for the petroleum, metals and carcinogenic polycyclic aromatic hydrocarbons that had contaminated the site’s soil, sediment and groundwater. After Ecology secured Puget Sound Initiative funding, GeoEngineers oversaw the comprehensive site cleanup the firm had planned. Cleanup measures included excavating and removing contaminated soil and sediment adjacent to and in Port Townsend Bay; removing the storage tank and debris; capping upland contaminated soil, documenting archaeological and historical features; grading to restore a quarter mile of beach; and replanting trees, shrubs and dune grass. The work was completed in December 2012. Kathleen Kler, Jefferson County Parks and Recreation Advisory Board member, addresses the assembled crowd.